Canvas, with 2.75 inch wraparound border added each side, sprayed and mounted on a sturdy 1.5" thick wood stretcher frame, ready to hang on the wall. Border style = Normal mirror image. Signed and numbered. See illustration at left. Canvas, with 2.75 inch wraparound border added each side, sprayed and mounted on a sturdy 1.5" thick wood stretcher frame, then inserted into a black shadow box, ready to hang on the wall. Border style = Normal mirror image. See illustration at left. 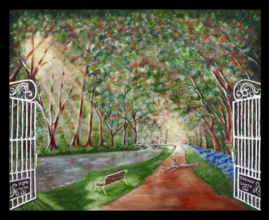 The "Hope Through Cancer "Painting is one of the most unique painting of a cancer survivor's journey with hope. Faith has Ovarian cancer and this is the mental image she tried to have to be able to relax and be calm in spite of the diagnosis. She would close her eyes to see a mental image of a path, calm waters, shade, light, and hope. 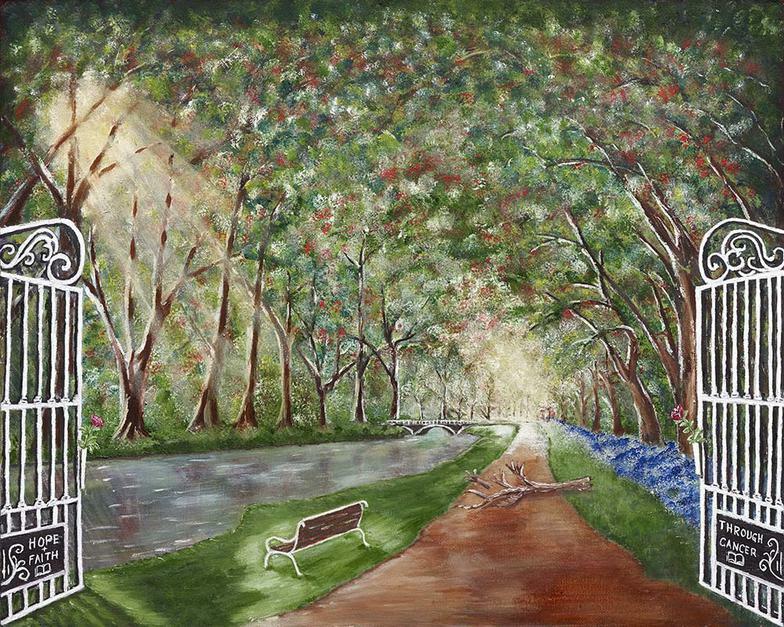 The painting is an artist's perception of a survivor's journey with hope in the light of Psalm 23. 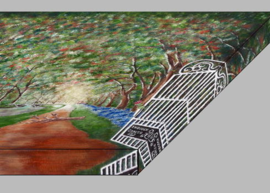 The book "Hope Through Cancer" (coming out this fall) describes in details each part of the painting. The Psalm 23 can be seen throughout the painting. example "He makest me to lie down in green pastures" or " He leadeth me beside the still waters" or "He restoreth my soul" etc. A short description is included with any purchase of this painting. You can purchase prints framed or not! Click Here For More Paintings.